Can I skip a repayment? What if I can’t make this week’s repayment? We understand that being a small business owner comes with cash flow crunches. We are committed to helping you in such a moment. That’s why we make it easy for you to skip a repayment and get back on-track the following week. You can request a skip from inside the application (see How to skip a repayment). You must request the skip before 12pm (ET) Tuesday (to skip the week’s repayment normally retrieved the following day, Wednesday). Repayments can only be skipped one week, not multiple weeks. 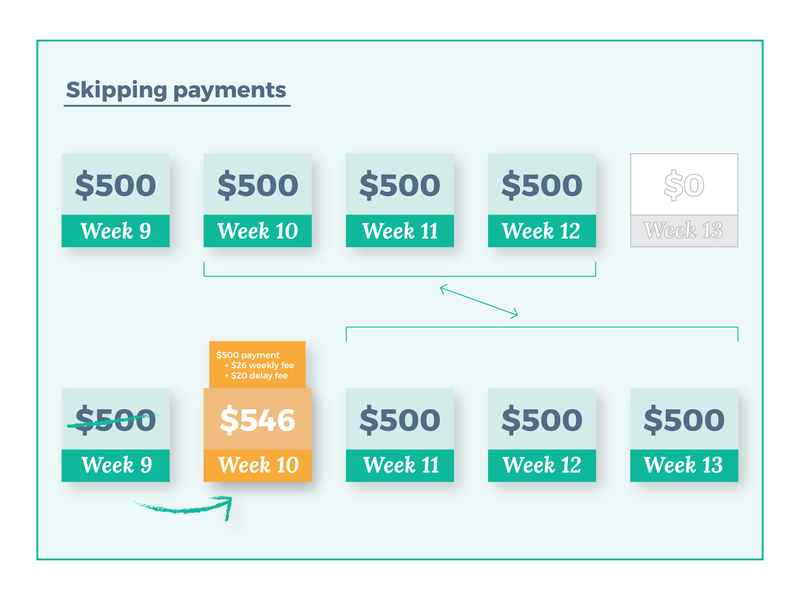 Skipped repayments are due the following week, along with a $20 administrative fee and an additional weekly fee equal to 0.5% of the original advance amount. Skipping a repayment will shift your remaining repayment schedule one week later. Note that returned repayments will result in a $40 fee and an additional weekly fee equal to 0.5% of the original advance amount. Multiple missed repayments could potentially disqualify you from future use of your FundThrough account.